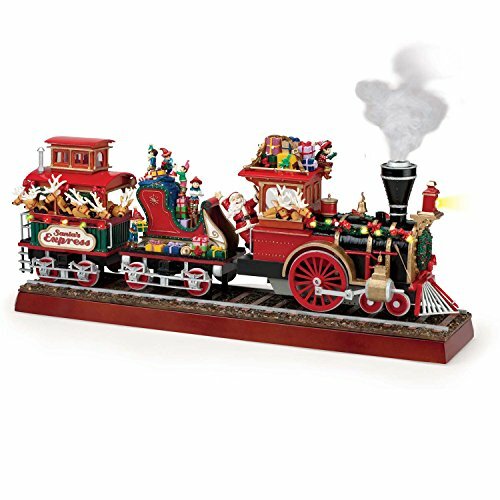 A train full of music, motion and fun! Santa's Express is loaded up with gifts, animated elves and reindeer. The reindeer look out from the caboose eagerly as the elves prepare the gifts. As a song begins to play, the wheels on the train begin to turn and move faster as the tempo picks up. The smokestack billows real smoke to delight the kid in all of us! Just a few drops of the included propylene glycol will bring the smokestack to life with billowing puffs of real "smoke." Plays 20 famous Christmas and railroading songs. Songs include "Wabash Cannonball", "I've Been Working on the Railroad", "We Wish You a Merry Christmas", "Jingle Bells", "Joy to the World", "Deck the Halls", "Casey Jones", "O Come All Ye Faithful", "12 Days of Christmas", "God Rest Ye Merry Gentlemen", "Hark! The Herald Angels Sing", "She'll Be Coming 'Round the Mountain When She Comes", "The First Noel", "O Christmas Tree", "Jolly Old St. Nicholas", "Good King Wenceslas", "Here We Come A-Caroling", "Up on the Housetop", "I Saw Three Ships", and "Good Christian Men, Rejoice". A spotlight shines from the head end and the sides of the train are adorned with garland and mini LED lights. Includes a 9vDC/800mA UL listed adaptor. If you have any questions about this product by Gold Label, contact us by completing and submitting the form below. If you are looking for a specif part number, please include it with your message.